FOMO /ˈfōmō/ (noun): “fear of missing out” Anxiety that an exciting or interesting event may currently be happening elsewhere. Our week at Dell Technologies World started out innocently enough. Introduce a few new products, start some great conversations, hear our customers’ stories, and maybe have a little fun. What we got was the most exciting week of PowerEdge action since we launched the 14th generation last year. Somewhere between being the week’s biggest trending topic, and looking out over another packed session, we had a revelation: people really love PowerEdge. And that love was in full bloom at Dell Technologies World. If you joined us in Vegas, here’s a quick recap of a truly wild week. If you were simply there in spirit, here’s a quick look at what you missed. Tuesday’s Launch: Got A Need for Speed? 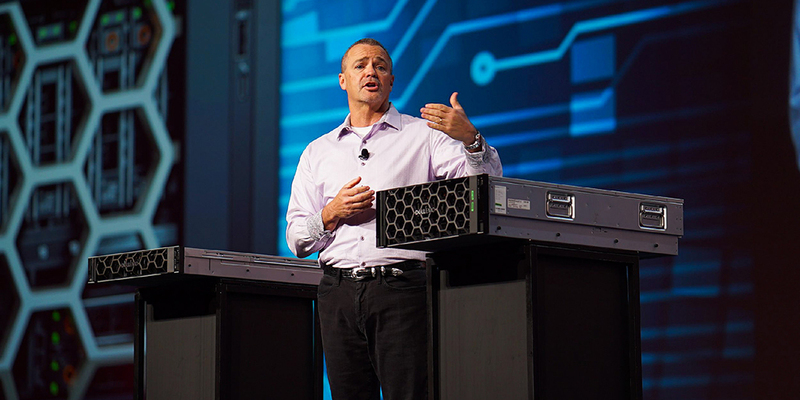 With no time to waste, we shifted into high gear at Jeff Clarke’s Tuesday morning general session to reveal our new PowerEdge R840 and R940xa servers. Built for the rigors of AI, machine learning and intensive data analytics, these 4-socket beasts were given a hero’s welcome from the crowd’s big data devotees (BTW, the “xa” stands for “extreme acceleration). When Jeff called the R940xa “bar none, the fastest and most intelligent server on the planet”, the race was on to get a hands-on look in our expo booth. Jeff’s Tuesday session also offered a sneak peek at the evolution of PowerEdge and our kinetic infrastructure solution – a modular approach that allows users to assign the right resources for the right workload and to change dynamically along with their business needs. Scroll to around the 51-minute mark of Tuesday’s session re-play for an overview by our director of engineering, Joyce Metevier. How fast can you deploy 500 servers? A few days? A few hours? Plenty of visitors to our expo booth put their admin skills to the test with our OpenManage Enterprise challenge. Believe it or not, many of them deployed 500 servers in less than 2 minutes. No tilting, no cheating, no sorcery, OpenManage Enterprise is just that easy to use. Meeting customers and hearing about what they’re doing with PowerEdge is, without question, our raison d’être at Dell Technologies World. And were here to report that our customers are doing some incredible stuff with these servers. They’re visionaries using PowerEdge to provide people around the world with the tools they need to ensure a free and open Internet. They’re IT leaders who rely on the compute power of PowerEdge to analyze data from the world’s largest and most powerful particle accelerator (yep, that one). They’re cloud service providers who trust the reliability of PowerEdge so much that they’ve deployed over 6000 servers over the course of the last 13 years. And when they experience zero downtime, they come to us with new words to describe their experience: FANTABULOUS. All-in-all, it was an amazing experience for PowerEdge and the people who live and breathe it, and this wrap up is just barely scratching the surface. If you were there with us, get ready to level-up next year. If you missed out, you can re-live the sessions, re-play the panel discussions, and immerse yourself in some 360 degree VR scenes from the show over at our live archive. It’s the next best thing to time travel. We’ll also be releasing videos of select sessions, as well as those great customer conversations over at our PowerEdge YouTube playlist, and on Twitter at @DellEMCServers.